We, Tag Automation, established in the year 2005, are well known supplier of an extensive range of Messung PLC, AC Servo, HMI Panel, Compact PLC, Modular PLC, HMI Series, Variable Frequency Drive, Low Voltage Switchgear, Servo Amplifiers and many more. In addition, we are also engaged in providing a wide range of services such as Machine Reconditioning Service, PLC Repairing Service and PLC Training Services, etc. The diverse range of products and services is available at industry leading prices. We are backed with a-state-of-art infrastructure facility consist of a well developed manufacturing unit, enables us to meet the bulk requirement of our clients in a given time line. Furthermore, we provide various dimensions in our products, as per client's specification. Under the able guidance of our mentor, Mr Ajay Kumar Singh, who have 12 years industry experience, we have carved a niche for ourselves in the industry. Moreover, by fulfilling the needs and desires of our clients, we have gained annual turnover amount around US$ 0.25 Million ( up to Rs.1 Crore(INR) approx). We are a quality conscious organization, engaged in providing a diverse range of products and services to our clients, which meet the international quality standards. We are supported with in-house testing unit, enables us to provide a superior range to our clients. Furthermore, our quality experts pay complete attention right from procurement of raw materials to the final dispatch of consignments. They conduct various tests on various parameters, to assure their quality. 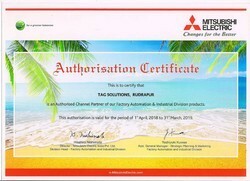 Authorised Distributor Certificate Of MITSUBISHI ELECTRIC. Backed by our in depth industry expertise, we are engage in manufacturing and supplying a superior range of Electrical Control Panel. The diverse range of product is made using high grade raw material procured from reliable vendors across the nation. We provide various specification in our products, as per client's requirement. We are engaged in providing a diverse range of service such as machine reconditioning, fault finding for PLC, AC drive and PLC repairing to our clients. The wide array of PLC repairing services is widely used by various industries for the purpose of industrial automation and process automation. Furthermore, with the help of our team, we are fulfilling the various requirement of our clients in a given time line. The extensive range of services meet the international standards and norms, which is widely acclaimed by our clients across the nation. We are backed by a diligent team of experienced professionals, who are committed to provide a superior range of products and services to our clients at industry leading prices. They work in close co-ordination for achieving the organizational goal. With the help of our sales and marketing executives, we are reaching the exact requirement of our clients in a given time line. Moreover, owing to the hard work of our team members, we are capable of providing customized solution to our clients at reasonable prices. Being a client centric organization, we are offering a diverse range of products and services to our clients, as per their requirement. Furthermore, our range is hugely appreciated by our clients across the nation for its unique features. We provide our range in a given time line to our clients, which meet the international quality standards. Moreover, our innovative techniques, dedicated approach and state-of-the-art facilities, enabled us to provide a superior range of services to our clients.